Dazzle your friends and family with a Fresh Strawberry Dessert Flower! I love to celebrate strawberry season by making strawberry desserts as often as I can! I still like to go to Strawberry Farms every May and pick my own berries. However, even after the strawberry season has passed in Illinois, we can still find an abundance of beautiful, juicy berries in our local grocery stores and farmer’s markets. Whether you serve my Fresh Sugared Strawberries, my Best Ever Strawberry Shortcake or create this Fresh Strawberry Dessert Flower… you will not be disappointed! This Fresh Strawberry Dessert Flower is impressive enough for company but is super simple to make. 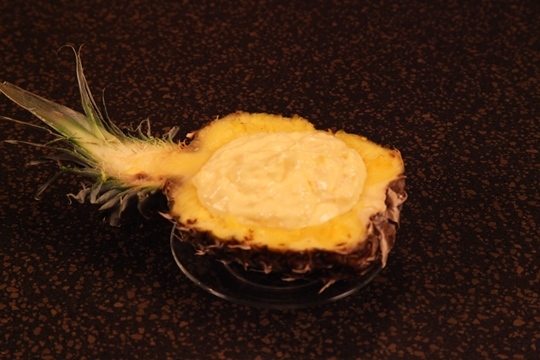 It starts with a creamy and sweet base made of just three ingredients and then the “flower” is assembled on top of the base. I like to add some fresh blueberries for color and then top it off with my Easy Strawberry Sauce. Using an electric mixer, beat together the cream cheese, marshmallow cream and mayonnaise. 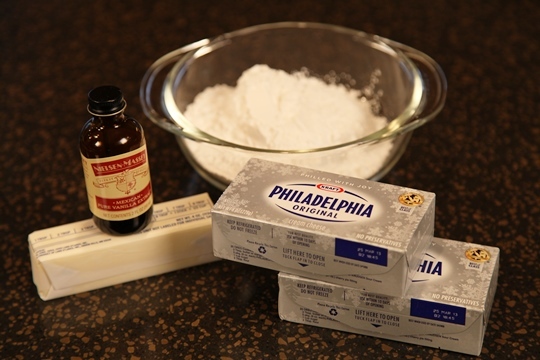 Mound the cream cheese mixture onto the center of a serving plate. Slice the strawberries in half as shown in the picture, from the tip of the berry to the stem. 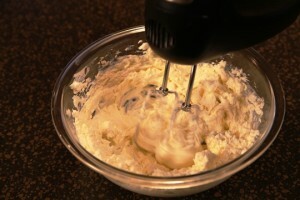 Beginning on the outside edge to the cream cheese mound, place the strawberries around the outside edge of the mound. 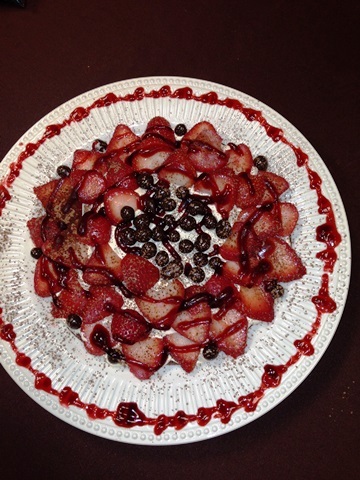 Continue placing the strawberries around the circle to resemble petals. Leave a small circle in the center open and sprinkle fresh blueberries in the center. Sprinkle additional fresh blueberries over the petals. Drizzle the Easy Strawberry Sauce over the Strawberry Flower. 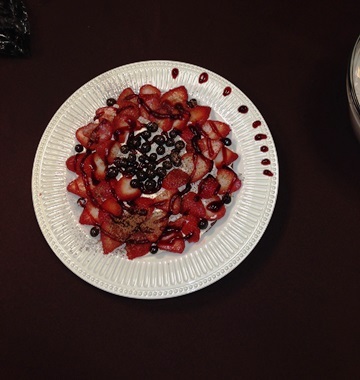 If desired, decorate the outside edge of the plate by making dots with the Strawberry Sauce and connecting the dots using a toothpick. 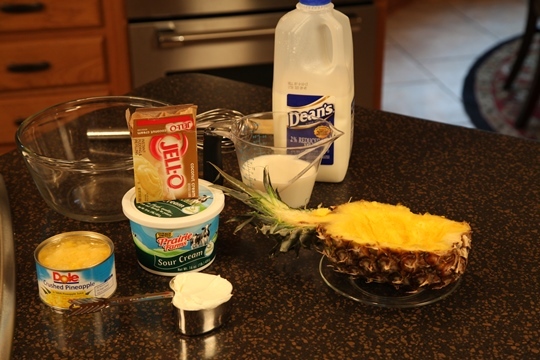 If you have any of the cream cheese mixture leftover, you can use it as a yummy dip for any fresh fruit. 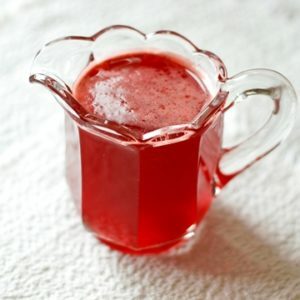 The Strawberry Sauce is also great served on pancakes, waffles, crepes or on top of ice cream. You can also use it to make Strawberry Milk. On the fun side of things, I often have trivia questions in my Culinary Arts classes. One of the trivia questions I ask is, “What fruit wears it’s seeds on the outside?”. The answer is “Strawberries!” Here are some more Strawberry Fun Facts! If you want to check out some other great desserts, my friends at Positive Health Wellness have posted “9 Cheap and Healthy Desserts For Your Family” that includes recipes such as Chocolate Panini, Oatmeal Cookie Bars and Cherry and Berry Smoothies! Remember, “Let’s Make Life Special by Sharing Great Food With Our Family and Friends!” Enjoy! Sprinkled Ice Cream Cones make serving a dessert bar a snap! 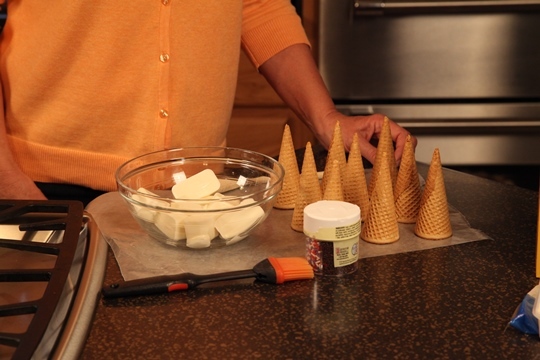 Dress these Sugar Ice Cream Cones up before the party starts and your dessert bar will be a snap to serve! 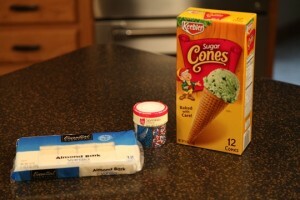 Set out a selection of ice cream flavors chilled in a tub of ice and dessert is done! 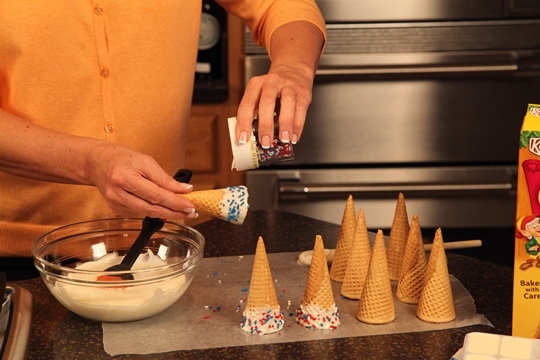 These Sprinkled Ice Cream Cones are so quick and easy to make! All you need is a package of sugar cones, some vanilla almond bark or white chocolate and sprinkles decor in whatever colors you choose. 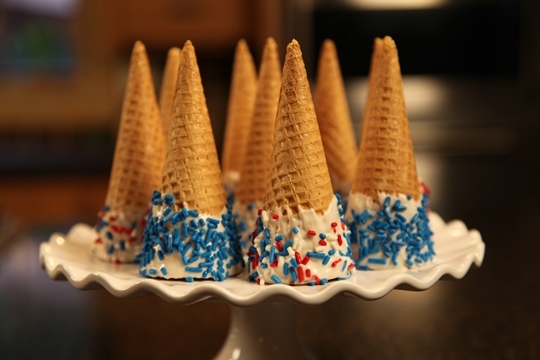 Kids of all ages love these cute Sprinkled Ice Cream Cones! 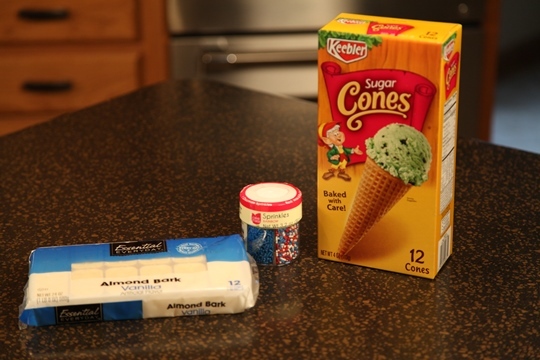 Set out a selection of ice cream flavors chilled in a tub of ice and dessert is done! 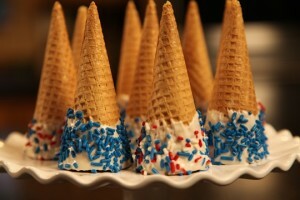 Dressing up a dozen sugar cones before the party starts streamlines the dessert bar and kids of all ages love these! Melt the almond bark in the microwave for 90 seconds. 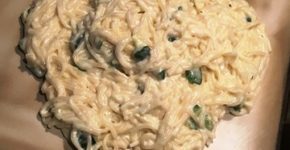 Stir and microwave an additional 15 seconds. Stir. Using a pastry brush, brush the melted almond bark around the top edge of the ice cream cones. Set the cones on a piece of waxed paper to let the almond bark dry. 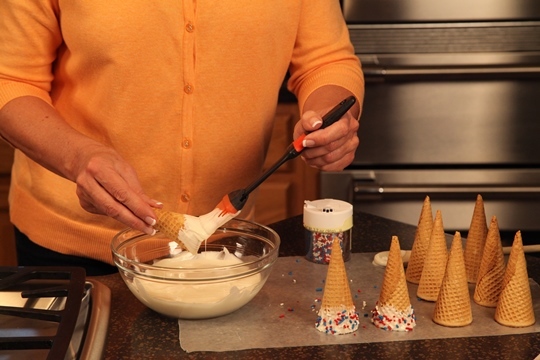 Only 3 ingredients make these Sprinkled Sugar Ice Cream Cones quick and easy! Melt the vanilla almond bark or white chocolate according to package directions. I heated mine 90 seconds, strred it and heated another 15 seconds. Melt the almond bark in a large bowl in the microwave. To really make the dessert bar festive, I served the Sprinkled Ice Cream Cones on a cake stand. 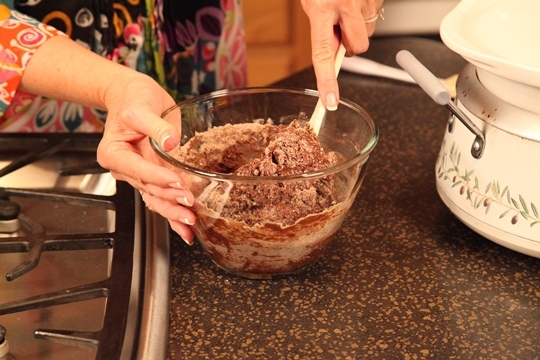 Gobs of Chocolate is one of many great chocolate desserts you can make in the crock pot! 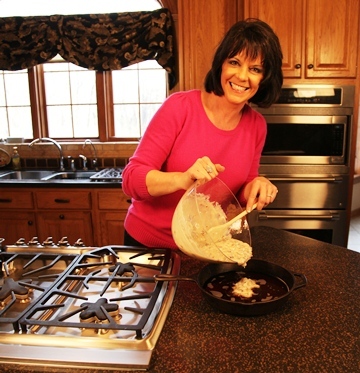 Wouldn’t you love to make chocolate desserts like grandma used to make….but in the crock pot? Gobs of Chocolate is just one of the many yummy chocolate desserts you can make in the crock pot! I remember all of the great chocolate desserts my grandma used to make…and the wonderful smells that came out of the kitchen when she was cooking. This recipe takes me back to her kitchen when I smell this gooey chocolate dessert cooking in the crock pot. And…the best part is the crock pot does all of the work! It cooks in only 2 hours on High so it’s also a great recipe for entertaining. I made this last week and there wasn’t even a bite leftover! 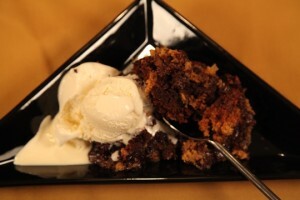 Serve it with vanilla ice cream and get set for some WOWS! 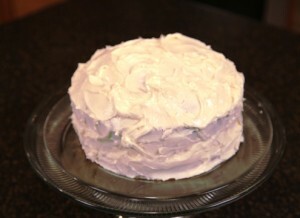 Watch my how-to video tutorial for this recipe! This chocolate dessert recipe will take you back to your Grandma’s kitchen! But..you make this in the crock pot! 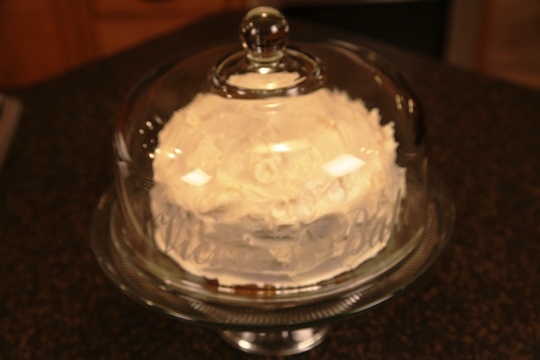 Wouldn't you love to make desserts like Grandma used to make....but in the crock pot? Gobs of Chocolate is that oooey gooey chocolate dessert we all crave! So...grab you crock pot and get ready to make your chocolate dreams come true! Spray a 4½ quart crock pot with cooking spray and lightly dust with flour. In a large bowl, mix the brownie mix with ¼ cup melted butter and 2 of the eggs. 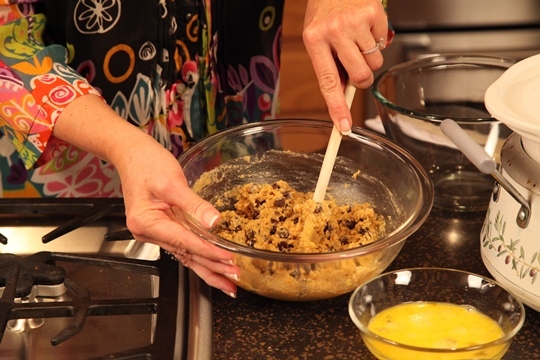 In another large bowl, mix the chocolate chip cookie mix, remaining ¼ cup melted butter and remaining 2 eggs. Drop alternate spoonfuls of the brownie mix and chocolate chip cookie batters into the crock pot. Cover and cook on high for 2 hours or until cake is set in the center. To serve, spoon cake out of the crock pot and top with big scoops of vanilla ice cream. 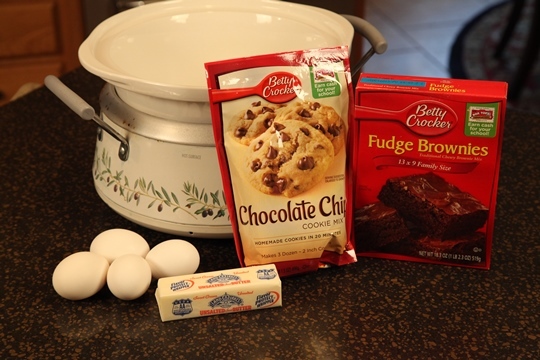 Mix the fudge brownie mix, 2 of the eggs and 1/4 cup butter, melted. Mix the remaining 2 eggs, remaining 1/4 cup butter, melted and the chocolate chip cookie pouch. Drop spoonfuls of both batters alternately into the crock pot. Cook on High for 2 hours. 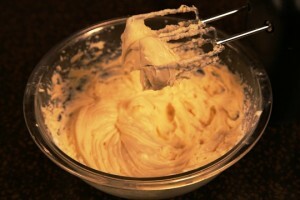 Cake batter should just be set on top. Serve by spooning the Gobs of Chocolate dessert out of the crock pot and top with big scoops of vanilla ice cream. Looking for a quick and easy apple crisp recipe? 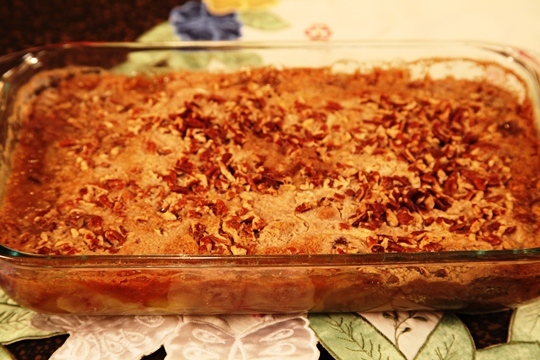 This easy apple crisp recipe is YUMMY! 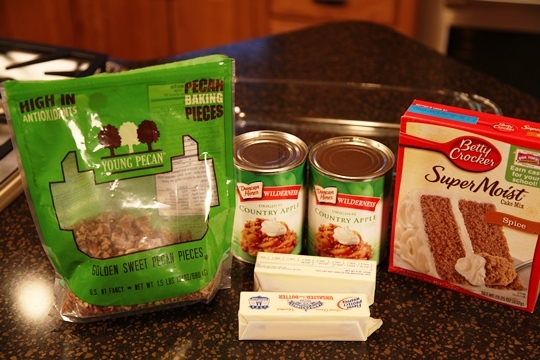 The typical apple crisp recipe has an oat and nut and sugar topping mixed with butter and crumbled on top. This Make Life Special easy version of an apple crisp recipe is topped with a Spice cake mix , nuts and melted butter to create that crunchy sweet topping we all love. 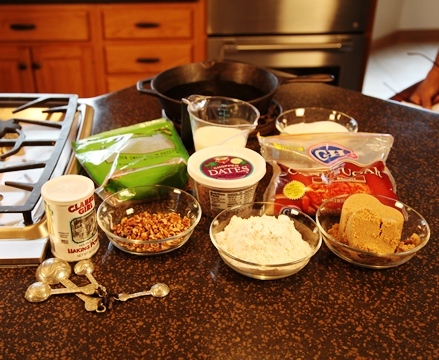 Plus, the spice cake mix really adds a great cinnamon and spice flavor to the dessert. 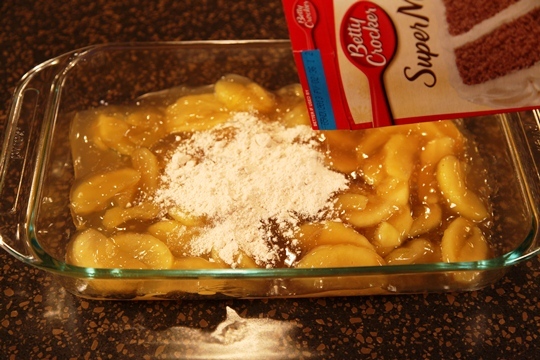 And, what could be easier than to use canned apple filling! 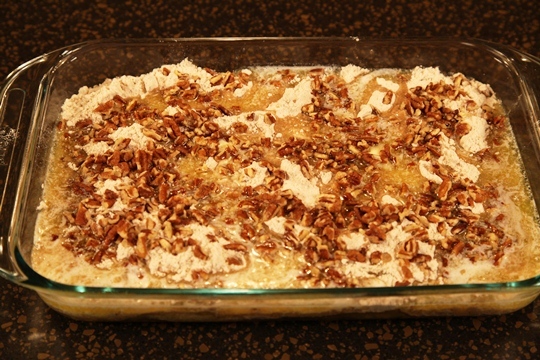 Make Life Special recipes are all about EASY so enjoy this EASY and YUMMY Apple Crisp recipe! Grease a 9 X 13 inch pan. Spread pie filling in bottom of pan. 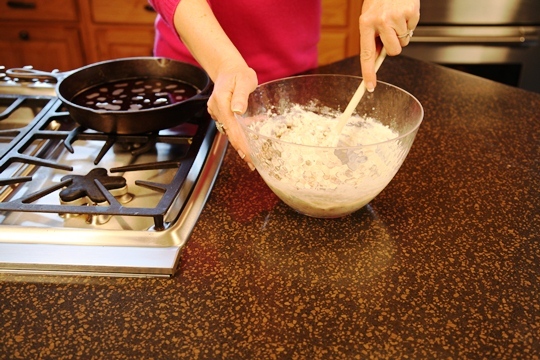 Sprinkle dry cake mix evenly over the top. Enjoy a big bowl of this yummy dessert right out of the oven topped with vanilla ice cream and caramel topping! 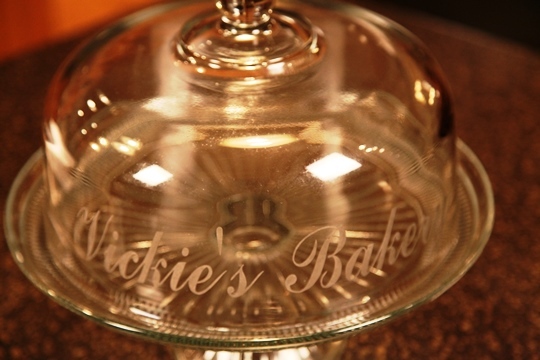 readers for a 3 quart oblong Pyrex Grab and Go baking dish with a lid. Sticky Date Pudding With Caramel Sauce is a Southern Treat! Sticky Date Pudding is an easy dessert that is great anytime of the year. 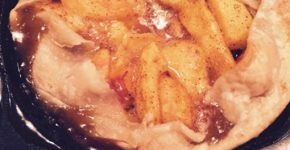 This recipe has been a tradition in my family for as long as I can remember and we always bake the Date Pudding in a cast iron skillet. Date Pudding bakes with a luscious gooey layer of caramel sauce under the tender cake that is filled with dates and pecans. Scoop up some Sticky Date Pudding and top it off with a big dollop of Homemade Whipped Cream and get ready to swoon! 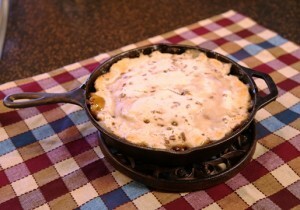 This is a “Make Life Special” quick and easy dessert so grab your cast iron skillet and let’s start baking! This is a "Make Life Special" Southern treat! Grab your cast iron skillet and get ready to bake! Combine warm water and dark brown sugar in a 10 inch cast iron skillet. Set aside. Combine remaining ingredients and mix thoroughly. 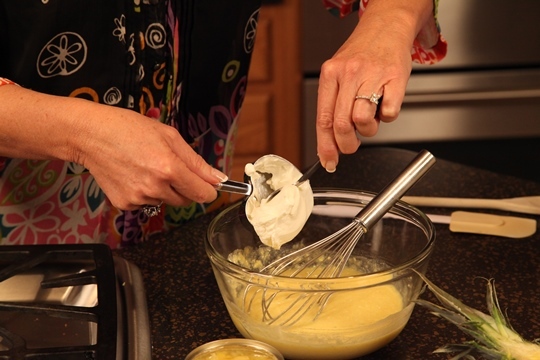 Pour this batter into the syrup. Bake at 350 degrees for 35 minutes. The top should be lightly browned. 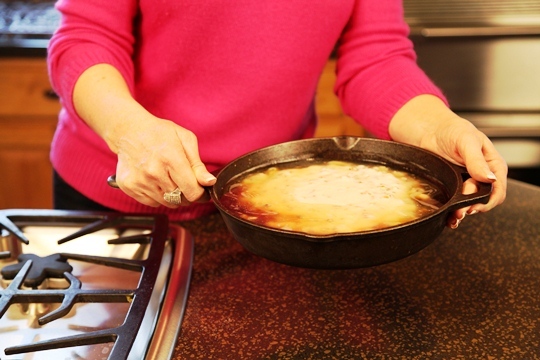 Combine the warm water and dark brown sugar in 10 inch cast iron skillet and set aside. 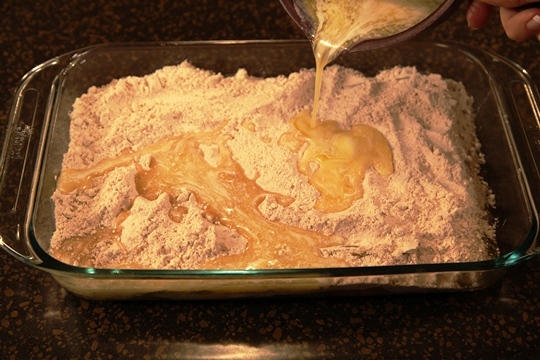 Pour the batter into the syrup mixture and it’s ready for the oven! Spoon warm date pudding into serving bowls and top with a dollop of whipped cream. 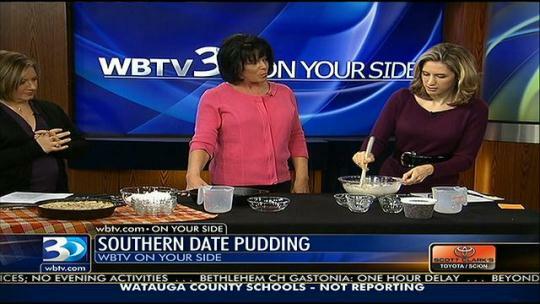 I made this dessert on the WBTV Charlotte Morning Show and the hosts LOVED it! This is truly a taste of the South in your mouth! And best of all, this takes less than an hour to make! Remember…Let’s make life special by sharing great food with our family and friends! Enjoy! Note: Photography for this recipe was provided by Martha Ruppert and we would like to thank her for a great job! Yonanas is the Frozen Dessert Maker With a Healthy Twist! The Yonanas was one of the last items to arrive at my front door for the Holiday Gift Guide and I must say I was VERY intrigued by this little kitchen machine! 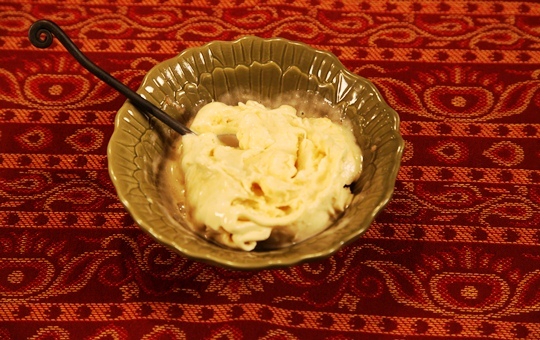 The idea of making healthy and low-calorie “ice-cream” was almost too good to be true! 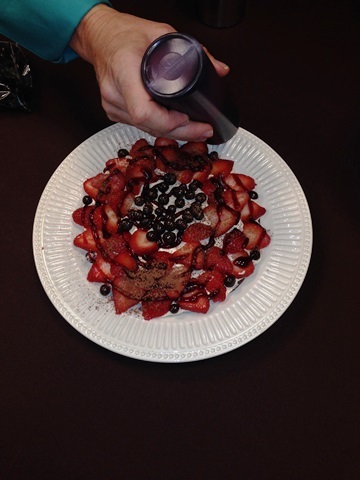 But, with the Yonanas frozen dessert maker— it can be done! I think this is great for anyone who is health conscious, is watching their weight or just wants to incorporate more fruits into their diet. What a great gift idea for any mother with small children! Or for grandparents to enjoy with their grand kids! 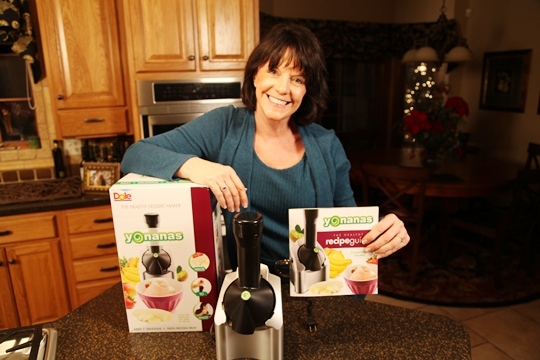 The Yonanas frozen dessert maker makes an “ice-cream-type” dessert by blending frozen bananas with other frozen fruits. 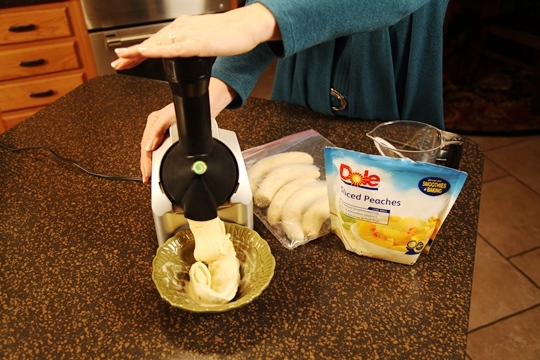 You need to peel the bananas and freeze them for at least 24 hours before making the frozen dessert. 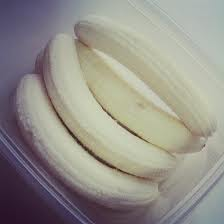 It is best to use bananas that are very ripe or “cheeta spotted”. These bananas have a high sugar content and will result in a delicious “gelato-type” frozen dessert. 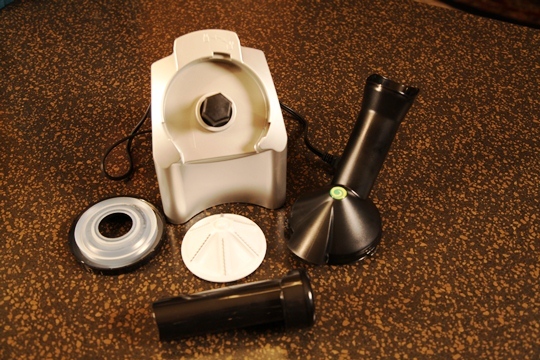 Here are the parts to the Yonanas machine –it’s pretty simple. It also comes with a Recipe Guide — just to get you started. This little cookbook has 22 great recipes including Strawberry Yonanas, Coffee Chocolate Chip, Mint Chocolate Chip, PB & J, Mixed Berry and more. For those who don’t like bananas or just want a different type of frozen dessert, you can also make no bananas yonanas using only frozen fruit. 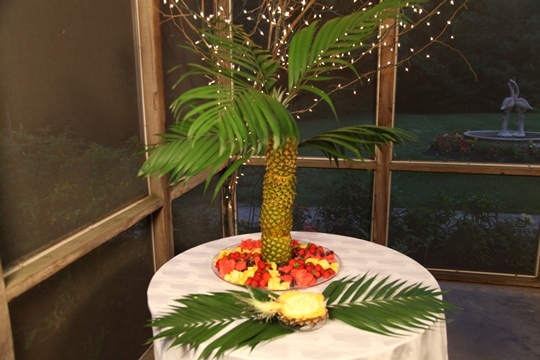 Recipes for this type include Tropical Sorbet, Strawberry Pineapple Sorbet Melon Sorbet plus several others. I made the perfectly Peach Yonanas and the Strawberry Yonanas. 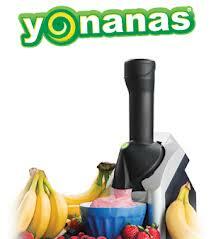 Here you see the Yonanas machine in action….. I was impressed at how effortlessly this little machine processed the frozen fruit. It was very easy to push the fruit into the Yonanas and it was not too loud. This is the perfect way to boost your fruit intake. It’s also fat free, dairy free and 100% guilt free. 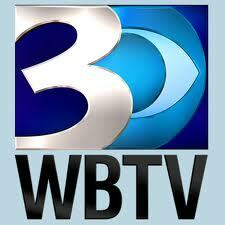 You can also buy it at QVC and Target. For more information, visit the Yonanas Website….. or visit Yonanas on Facebook. Note: I received a Yonanas Machine to try for this review. No compensation was received. These are my true and honest opinions.